I entered the Academy in July 1981 and was one of 30 recruits in the class. Seven were female and the remainder were male. At that time females had to be 18 and could only be accepted into adult training. Males on the other hand could enter at 16 and complete a two year course as a cadet. Tasmania Police is progressing towards gender equality and in the last recruit intake 10 members were female and 10 were male. Later that year I graduated from the Police Academy and was posted to Hobart. As a female we wore skirts and high heeled shoes. The only accoutrements we carried were a pistol with a two inch barrel which had dubious accuracy, handcuffs and a small rubber baton. If you had to use the baton it would bend or even break. We were also issued with a black handbag in which we carried our batons and notebooks. These could be quite handy in a brawl as they were heavy. There was no OC (pepper) spray which meant that when trying to arrest offenders who were resisting we would wrestle with them for a lengthy period, which often meant police officers or the offender were injured. The skirts and pantyhose were impractical and often a hindrance especially when trying to climb a fence or attending a disturbance. I would raise my skirt to get over the obstacle and the life expectancy of a pair of pantyhose was short. We were eventually issued very unflattering culottes and finally trousers. In Hobart the males were rostered on nightshift to patrol Government and Parliament houses which females weren’t permitted to do. I was however, rostered to work at the Botanical Gardens on Sunday dayshifts, where I would spend the 8 hours walking around the gardens. In 1987 whilst stationed at New Norfolk I applied for a position at Traffic Control. Before applying for the position I ensured I had completed the necessary courses. My Superintendent at the time put a note on my application stating: “she has shown an interest in traffic duties and this may be an opportunity to integrate a policewoman into the traffic office”. Well, it would appear that the Superintendent in charge of traffic wasn’t so sure. He requested that I go to his office for an interview. At the time I was married and he asked me if I ever intended on having children. At that time I had no intention of ever having children and I told him so. I was transferred to traffic and became the first female traffic officer in the State. As we know people do change their minds and in 1988 I became pregnant with the first of my three children. At six months I could not hide the fact that I was pregnant anymore and I had to tell the superintendent. He said “well, what are we going to do with you now?” to which I responded “nothing, I will keep performing the same duties”. had to return to work full-time or resign and I chose to return to work. I made it work and I just had to be well organised. At this time there were quite a few females who chose to resign and this meant that a lot of experience was lost. Nowadays, both male and females can apply to work part-time. Technology has certainly changed since 1981. We had manual typewriters and part of our training comprised typing lessons with Mrs Gates, who I can say I felt extremely sorry for, as typing was not the forte of some of us. While I have highlighted some aspects of working in a male dominated area I have always been treated with respect and given opportunities that many outside this organisation would have never had. I have been fortunate enough to attain promotion and transfer to other areas in the state. While there have been sad and frustrating moments I have thoroughly enjoyed every moment and I look forward to the future. 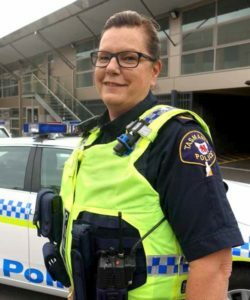 Kerrie was one of Tasmania Police’s two longest-serving women police officers when she retired in 2017 after 36 years in the service. She graduated from the Police Academy in 1981, along with six other female officers. As a first year Constable, Kerrie spent almost four weeks at Strahan for the Franklin Dam blockade, where she ditched her skirt and stockings for custom-made trousers and wet weather gear. In the years that followed, Kerrie moved from Burnie to Hobart, spent time in Canberra with the now Australian Criminal Intelligence Commission, then to State Intelligence Services, Queenstown, the Drug Squad and finally Forensic Services. which can find a match in minutes; but the final determination must still be made by two independent experts. Kerrie also recalls her role during the Australian Pulp and Paper Mill pickets. One of her brothers was on the picket line, while Kerrie was responsible for videoing police responses. “We always made sure we were on separate gates at the mill,” she said. Another recollection, and not a fond one, was on a reconnaissance flight with Inspector Heather Innes as the pilot. “We were fire spotting for TFS at Valentines Peak and also looking out for the druggies who come out to rescue their crops from the fire. In 2016 she was awarded the Australian Police Medal during the Australia Day Awards, something she describes as a career highlight. Kerrie believes she made the ideal choice all those years ago when she wandered into the Burnie Police Station and enquired about job vacancies. She had no idea that policing would allow her to achieve so much and experience things that would never be possible in other occupations. Policing is, in Kerrie’s opinion, 101 jobs within one career. She feels very lucky that she’s been able to experience such a variety, including a secondment to the Federal Bureau of Investigation’s National Academy at Quantico in the United States and an international deployment with the Australian Federal Police in the Solomon Islands. 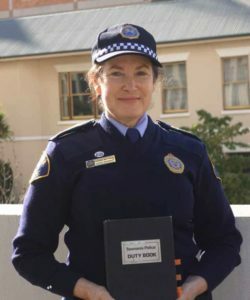 This page -- https://www.police.tas.gov.au/about-us/100-years-women-policing-tasmania-police/agents-of-change/longest-serving-female-officers/ -- was last published on January 17, 2018 by the Department of Police, Fire and Emergency Management.